You are here: Home / Is Cooking Bison Similar to Beef? Many ask us if cooking bison similar to beef? Yes, but it needs to be handled slightly differently. Follow these basic tips. Bison meat, though similar to beef, needs to be handled and cooked a little bit differently. You will find you can interchange bison meat with all your favourite beef recipes, if you follow a few basic tips. Fat is an insulator, and heat must first penetrate this insulation before the cooking process begins. Bison, with its low fat content, does not have this insulation, and therefore does not need to be cooked as long with as high a temperature to get the job done. Turn the temperature down by about 50 degrees, and the meat will be done in the same amount of time as beef would be; as we say, “less heat to reach the same doneness.” Rare to medium rare is best for tender cuts. Very slow, moist heat works especially well with the less tender cuts. Really watch the cooking process the first time you try bison; note the amount o f time it takes to cook your the meat and what the result was. Bison is better with marinade than beef is, as there is only meat to soak up the marinade. If you use a sauce normally on the beef cut while you cook, by all means use sauce on bison. With a little practice, this meat can be as easy to cook with as beef. Bison meat, cooked properly, tastes very much like beef, only better, healthier for you, cleaner tasting, and it has a fuller richer flavor. It is not gamey or wild tasting as the animals are raised domestically, eating domestic grasses and grains. Fat acts as an insulator in meat, and because there is less fat in bison meat, the cooking time is reduced. When cooking bison, be aware of the time and avoid overcooking. Bison Steaks – Cook quickly under high heat. To retain more juices and reduce the chance of overcooking, turn only once. Having the steaks chilled or slightly frozen when grilling will also help. 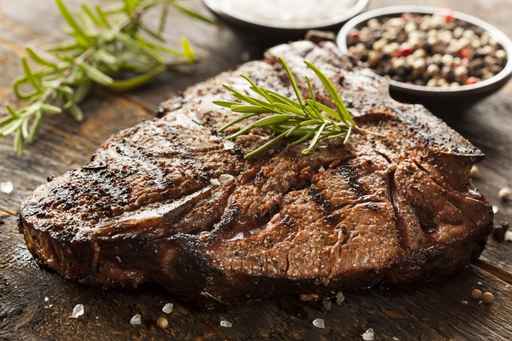 Steaks are enhanced with the use of sauces, marinates, and spices. The low fat content ensures greater penetration of the above into the meat so each bite is flavorful. Bison Roasts – cook under low, moist heat at 275-325 degrees F. Use a meat thermometer and remove from oven at 140 – 150 degrees F. for rare-medium. Roasts continue to cook after removal from oven; therefore, remove 5 degrees before it reaches desired doneness. The meat absorbs sauces and marinates very well for a variety in tastes.